In May, with the release of KM1, we unified our legal research websites into an integrated platform that we renamed knowledgemosaic. Our goal with knowledgemosaic has been to extend the reach of our news and research services to the entire federal legal and regulatory landscape. In early October, with the release of KM2, we dramatically advance toward that goal. Below you’ll find a list of the knowledgemosaic enhancements delivered by KM2, along with analysis of their importance for you. First – Engineering a High Performance Technology Engine. For the past four months, our engineers have dived under the hood to turbocharge the knowledgemosaic technology engine. The data foundations of our business are complicated; with KM2, you will experience the pleasure of a legal news and research service that is exceptionally fast, reliable, and complete. Second – Vastly Extending the Scope and Volume of our Data Coverage. KM1 allowed you to search documents from 10 regulatory bodies — primarily financial. KM2 broadens the scope of our coverage to 18 regulatory and oversight bodies. When we release KM3 next spring, our data set coverage will encompass more than 30 federal regulatory and oversight agencies. 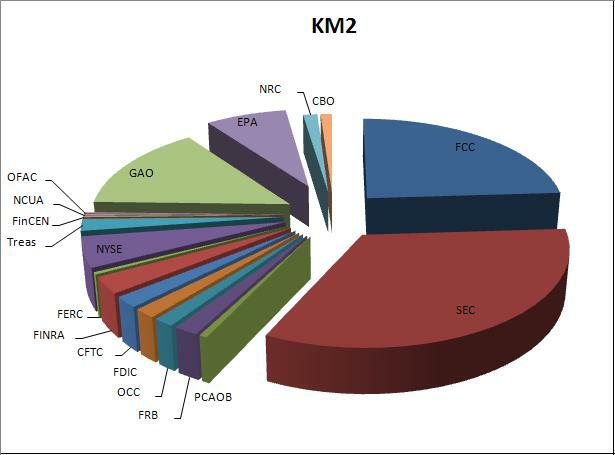 New agencies released for KM2 include financial regulators such as the Financial Crimes Enforcement Network, the Office of Foreign Assets Control, the National Credit Union Administration, and the Treasury Department. These additions enable knowledgemosaic to offer comprehensive coverage of federal financial regulation. We also add new energy and environmental regulators to our existing coverage of Federal Energy Regulatory Commission – the Environmental Protection Agency and the Nuclear Regulatory Commission. Finally, we will harvest full data sets from two important Congressional oversight and research bodies – the Government Accountability Office and the Congressional Budget Office. We are particularly proud to be adding nearly 40,000 GAO reports alongside our existing collection of indexed links to nearly 100,000 law firm memos, providing the largest collection of legal practice and policy guidance in the world. What will KM2 Mean for You? Knowledge Mosaic pursues a single goal — to free legal, business, and media professionals to more confidently serve their clients and grow their businesses. The heart of this effort is to deliver online data — the lifeblood of communication in the 21st century — into all of these markets. No one does it better. The knowledgemosaic platform already offers you state-of-the-art transactional search of SEC disclosure documents. We have undertaken trailblazing research to tag SEC disclosure and enforcement data that allows you to quickly isolate language, run reports, and harvest insight to share with your clients that previously would have taken days or weeks of research. We will continue to do remarkable work with SEC disclosure and transactional data. However, these achievements represent only the beginning of Knowledge Mosaic’s exciting project to organize information from across the entire landscape of federal government data — including legislation, regulation, guidance, enforcement, and court actions. This ongoing project will enable us to support the news and research needs of a broad range of practice groups and industries. Later this month, I will write about some of the important and dramatic changes to the market for transactional legal information services. I will offer a perspective on the transactional law business from someone who has been watching and participating in this business as a product developer and information services vendor to hundreds of law firms for nearly ten years. Until then, please feel free to contact me at any time with questions.